This is not a portrait any run-of-the-mill, garden-variety big-fingered boy — no, it is Joe, the Big-fingered Boy. One must admit that was not a very inventive stage name, but it was certainly descriptive. Joe and his over-sized digits graced sideshows at the turn of the twentieth century. According to author Max Rusid, Joe was a performer with the Colonel Cummings Wild West Show during the 1906 season. 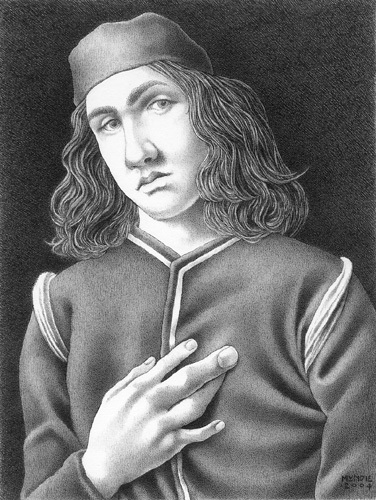 My portrait of Joe was inspired by one of his pitchcards and Sandro Botticelli's late fifteenth-century painting, Portrait of a Youth in the collection of the National Gallery (Washington D.C.).